Fuel sender resistance data editor. Data editor can be used to manually enter fuel calibration data or to correct an existing calibration curve. Fuel remaining, trip fuel used, total fuel used, consumption rate (gal/liters per hr), Time-To-Go (at current consumption rate) before fuel gone. Works with all popular fuel senders, both American and European standards (Centroid THREE terminal senders, Faria, GM, VDO, Teleflex, Stewart-Warner, etc.) 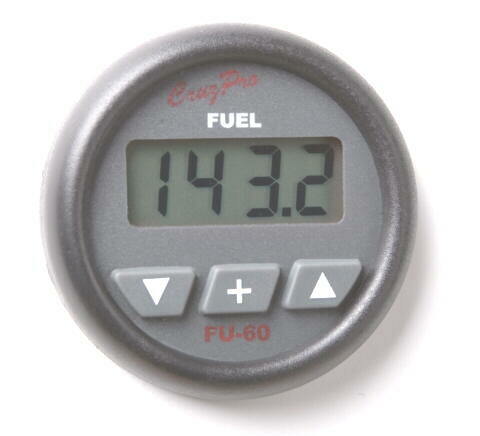 The FU60 digital fuel gauge is manufactured to work with any standard resistance type level sender having the following resistance ranges: 0-30, 0-70, 0-90, 10-73, 10-180, 33-240, 40-250 ohms (and their reverse 30-0, 70-0, 90-0, 73-10, 180-10, 240-33, 250-40 ohms). The FU60 will actually also work with any non-standard resistive sender that varies from a minimum of 0 ohms to a maximum of 300 ohms or a maximum of 300 ohms to a minimum of 0 ohms. For example, a resistive sender that varies in resistance from 100 to 150 ohms would work. So would a sender that varies from 75 ohms to 25 ohms. The FU60 can also be ordered from the factory set to work with 4-20mA senders or 0-5V sender, as a special order item. Programmable lower fuel level limit to turn ON a fuel transfer pump. Programmable upper fuel level limit to turn OFF the fuel transfer pump. Contact us for OEM customized versions to satisfy your particular application. The FU60 Digital Fuel Gauge displays fuel remaining in gallons, liters or percent (0-100%) in tenths, fuel used (gallons or liters), fuel consumption rate (gallons/hr or liters/hr) and "Time-To-Go" in hours and minutes at current consumption rate (before tank is empty). 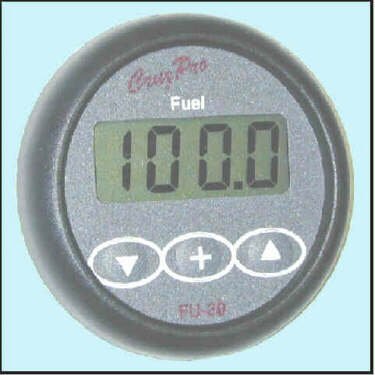 The CruzPro FU-30 digital fuel gauge is a plug-in replacement for your regular analog fuel gauge. No need for special flow sensors. The FU60 works equally well with gasoline (petrol) and diesel engines and requires no "subtractor" unit to compensate for diesel bypass. It works with your standard fuel sender manufactured by VDO, Teleflex, Faria, GM, Stewart-Warner, Centroid THREE terminal senders, Aerotech and others to compute fuel remaining, fuel consumption rate, trip fuel and "Time-To-Go" calculations. It accurately computes fuel remaining even if you have odd shaped tanks (such as often found in boats). You "train" the FU60 to learn your fuel sender characteristics and tank shape by calibrating the FU60. You do this once (at tim of installation) by filling your tank and stopping up to 20 times to tell the FU60 what the sender output means in gallons or liters at each point. The calibration data is saved into a non-volatile memory which retains the information even if the power is turned off. A built-in data editor enables you to manually enter the fuel level/sender resistance data or to make changes to exiting fuel sender calibration information. Low and High fuel alarms can be set over the entire range of the instrument/sender. When activated, the FU60 built-in 85 dB alarm will sound and the display will flash. The alarm can be enabled or disabled with a single key press. Five levels of backlighting can be selected and all set-up, calibrations constants, alarm values, and sender calibration values are saved to non-volatile memory. One of the screw terminals on the rear of the instrument can be programmed as a NMEA 0183 serial data output line, an external alarm output or as a fuel transfer pump control line to maintain fuel level in a day tank between two programmable low and high limits. Whereas standard analog fuel gauges are notoriously innaccurate, the FU60 "learns" the shape of your tank and eliminates sender errors and non-linearities. Another source of errors is varying battery voltage. The readings for standard analog fuel(or oil pressure and water temperature) gauges vary as your battery voltage changes. The readings can actually change 30% or more as your battery voltage varies from 11V to 14V. Intelligent CruzPro gauges regulate the battery voltage and send a highly regulated and temperature compensated voltage to your sender that prevents fluctuations due to battery voltage. 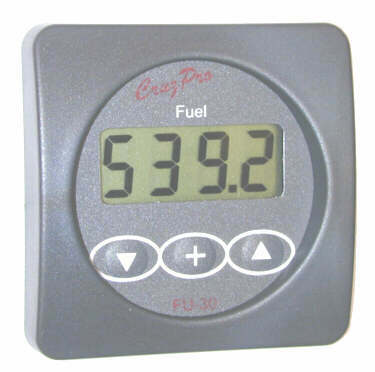 This ability for CruzPro gauges to learn your system errors and make them battery voltage independent provides an accuracy not available before and allows for a true fuel reading over the entire range from full to empty. Never worry about running out again. 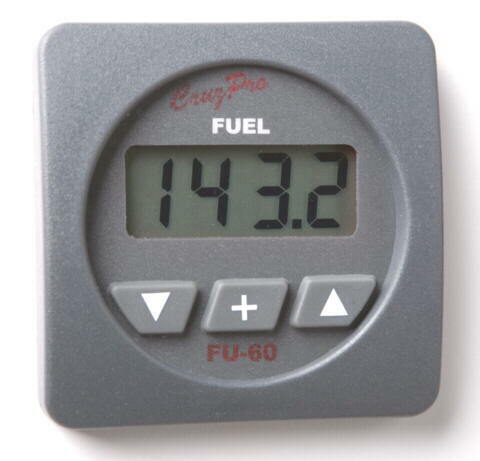 With a press of the button you can display fuel remaining (in gallons, liters or %), trip fuel used, total fuel used, fuel consumption rate, Time-To-Go at current consumption rate and low/high fuel alarm set-points. The FU60 draws only 0.017 amps and 5 levels of backlight (including OFF) can be selected from the front panel and is saved to non-volatile memory. The FU60 outputs fuel remaining and fuel consumption rate on the standard NMEA 0183 serial data line at 4800 BAUD. This ASCII information can be used to log performance or repeat the fuel and fuel consumption information at a remote location (see www.cruzpro.com/rp30.html and www.cruzpro.com/rp110.html) If NMEA 0183 serial data is not required, then the output terminal can be programmed as an external alarm output pin or Fuel Transfer Pump control line.